October 3, 2016 – Colorado School of Mines and Manufacturer’s Edge hosted Governor John Hickenlooper on September 30 to tour the Alliance for the Development of Additive Processing Technologies (ADAPT) advanced characterization center and meet with the center’s founding stakeholders. The governor also used the occasion to announce October as Manufacturing Month in Colorado. ADAPT is a consortium that provides manufacturers access to the latest research on how to take advantage of additive manufacturing technologies. In addition to Mines and Manufacturer’s Edge, ADAPT’s founding stakeholders include Lockheed Martin, Ball Aerospace, and Fauston Tool. ADAPT companies work closely with Mines researchers and students on world-class machines to develop technologies to accelerate certification and qualification of 3-D printed metal parts. Governor Hickenlooper toured the facility and met with manufacturing leaders to discuss the growth of the sector and the role of the Colorado Office of Economic Development and International Trade’s (OEDIT) Advanced Industry Infrastructure grant program. ADAPT was started with support from the State of Colorado in the form of an Advanced Industries Infrastructure Grant from OEDIT. This tour kicked off Manufacturing Day celebrations in Colorado, which continue throughout the month of October. Manufacturing Day is an annual celebration of modern manufacturing meant to inspire the next generation of manufacturers, including Mines students. 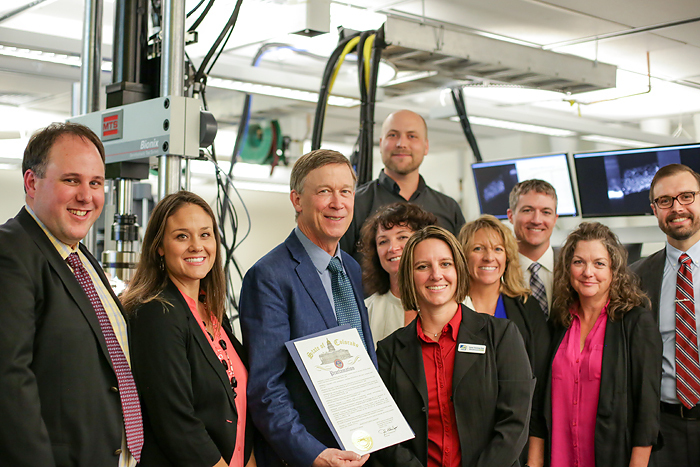 “In Colorado, one day is not enough to recognize our manufacturers— so we are declaring October ‘Colorado Manufacturing Month,’” said Governor Hickenlooper as he presented a proclamation during his visit. As ADAPT continues its work, the consortium is actively seeking additional academic and industry partners. Analysis is underway on more than 5,000 specimens with respect to build geometry, power, speed, number of lasers used and more, to build a robust database.